On July 6 at 6 Futcher Avenue in Rehoboth, a group of fun loving guys present the now-legendary summer pool party to raise funds for CAMP Rehoboth. With a suggested donation of only $15 (more is welcome!) payable at the door or at camprehoboth.com, this party is a giant celebration, attracting more than 500 people, with record years seeing the numbers splash towards 700. Party mastermind and CAMP Rehoboth Board Member Mike DeFlavia explains that the pool party is a natural extension of the huge theme parties a group of guys threw at a 5th Street rental house in the 90s and early 2000s. Mike joined forces with “house mom” Tony Sowers on July 4, 2000. Now, on Futcher Avenue, it’s gotten so huge, sponsors weigh in, like CAMP Annual Premier sponsor Smirnoff Vodka and support from Breakthru Beverage. 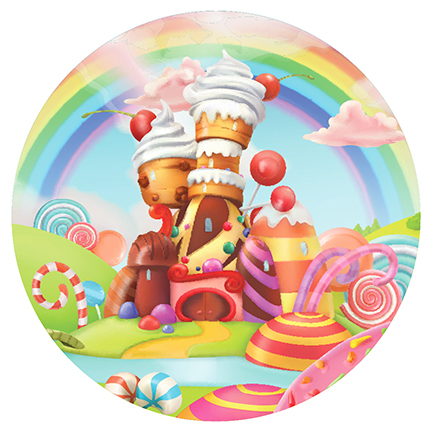 The theme this year is Candyland, and like every year, the team looks forward to the arrival of the guests and their expressions and excitement when they see the decorations and the crowd gathering in and around the pool. More about the party can best be explained by some of the participants. When was your first pool party and what did you think of the event? Tony Sowers: In the late 90’s I first started coming to Rehoboth at the rental house. Back then, most large share houses were expected—some might say pressured—to host a themed party. The 6 Futcher party started several years later as a result of the “CAMP Rehoboth Beach House Competition” started by current CAMP Rehoboth Board President Chris Beagle. The goal was to see which house could raise the most money for CAMP Rehoboth. Greg Oehme: My first party was the last one on 5th Street. Egyptian Gods. I still remember those pyramids. Since then, I’ve been at almost every pool party and have hosted for the last eight years. There’s a lot of work that goes on behind the scenes to make the event what it is. Mike Reimer: I’ve been the DJ since 2005 and friends with some of these guys for 20 years—since the rented house on 5th St. during the time of huge, themed house parties. I started spinning them back in 1998 with themes such as Saving Ryan’s Privates, Space Cowboys: Ride or be Ridden, and Egyptian Gods: Pleasure Amongst the Pyramids. Having a house with a pool and large backyard has added such an amazing element. Patrick Bosak: I’ve been involved since the first pool party. I took on the task of designing party invites, and I’ve been doing that every year. It’s such fun for a great cause. Cristian Becker: My first pool party was in 2010. I had just turned 21 and I remember having an amazing time and being shocked at the number of people there. There were people of all ages, backgrounds, shapes, and sizes, and everyone was having a fun afternoon with friends. Dennis Konzelman: My first party was Space Cowboys: Ride or be Ridden. I knew I was hooked and wanted to get involved with the decorating committee. I’m a Philadelphia Mummer, and feathers, sequins, glitter, costumes, and props are my thing. What’s your craziest pool party memory? Mike D: Hmmm. I don’t think my craziest pool party memory is suitable for printing. Mike R: Years ago, right in the middle of one of the parties, I noticed a line of paramedics and police entering the yard and thought it was a huge group in costume. Then someone told me a guest had tripped and required medical attention. The EMS asked me to turn the music down while they tended to the person, but it was only for 15 minutes, The party went on without (another) hitch and the injured guest ended up being fine. Greg: Craziest memory? Aren’t they all? Patrick: I loved the year it rained, and we had to postpone. We had Mike dress up in rain gear and sprayed the hose at him and did a video like he was reporting the weather and getting drenched. We posted it to Facebook to let everyone know the event was being pushed to the rain date. Cristian: About an hour before the party we were setting up the DJ equipment and realized one of the speakers wasn’t working. We found a music store in Lewes that had what we needed. We raced to Lewes in crazy traffic and made it back minutes before the party started. Dennis: The Studio 54th of July. With the red carpet entrance and paparazzi (dressed in full disco drag) taking pictures, people arrived in buses, bikes, and vans. Why do you feel good helping raise money for CAMP Rehoboth? Mike D: It continues to provide programs, events, volunteer support, and health screenings for the entire (local) community and throughout Sussex County. Without CAMP Rehoboth, the LGBTQ community might not have enjoyed such a welcoming Rehoboth Beach. Tony: I look to CAMP Rehoboth as the glue that brings the community together. Greg: It’s an honor knowing that my contribution goes toward keeping a strong LGBTQ presence in Rehoboth. Patrick: When I was coming out, I had a tough time in my home town so I “ran away” to California. I was 18, had graduated high school, was alone and struggling with coming out. I was introduced to the LGBTQ center and went to events to get HIV information and condoms. Organizations like this are super important to our community. It was a life saver for me. It feels good to give back now. Cristian: We are all very thankful for all CAMP Rehoboth does and happy to support it while having fun with our 600 closest friends. Mike R: Rehoboth wasn’t always as open and friendly as it is now. CAMP Rehoboth transformed it into a welcoming, inclusive town. It feels good to give back to an organization that has done so much for the community. What are you looking forward to this year at the party? Tony: Seeing friends who travel here from all over the country, once a year, primarily for our pool party. I am looking forward to hosting another successful event for CAMP Rehoboth, meeting lots of new people, and hopefully some hot sunny weather. Greg: Mike Reimer’s music and seeing who wears the skimpiest swimsuit. And believe me, many will try. Patrick: Spending time with friends, good music, and seeing what kind of sweets people will be eating, licking, and wearing. The theme should make things fun. Mike R: Despite knowing some of these guys for so long, this will be the first year that my husband and I are doing a share in the house. It will be fun to be part of all the preparations and décor-making. I look forward to DJ;ing, and I’m honored they continue to ask me to do it year after year. Cristian: Eight years after my first pool party, I am now married to DJ Mike Reimer. I’m am looking forward to spending the week at the house, being a part of the preparations and having fun with the 6 Futcher boys. Dennis: I am looking forward to hot weather and hot men!